"Don't get sick. And if you do, die quickly." 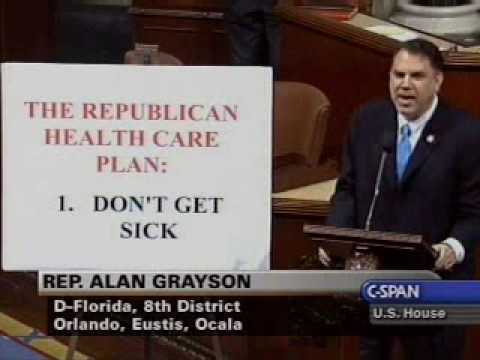 That was former congressman Alan Grayson's description of the Republican party's health care plan. And he was right. The Trump administration is now attacking the provision of the ACA that prohibits insurance companies from denying insurance on the basis of pre-existing conditions by refusing to defend it in a lawsuit brought by a bunch of red state assholes. The real-world consequences of refusing to defend would be hard to predict. They might be minimal. The courts can and probably will appoint lawyers to defend the ACA, as Somin points out. (For the record, I’m happy to volunteer for that job—it’s the sort of thing I used to do when I worked for the Justice Department.) So the final outcome of the litigation shouldn’t change. But declining to defend the ACA could have implications for whether the Trump administration chooses to enforce it. That’s a question that has become urgent with Idaho’s decision to flout the law. Unless HHS intervenes, other states will likely follow its lead. It’d be much harder for HHS to step in if the Justice Department takes the position that the whole law is unconstitutional. The fight to destroy the ACA is going to go on for decades. They're still trying to destroy Social Security, after all. But this is currently the only issue that is more important to the Democratic base than stopping Donald Trump. The Democrats must make sure their voters know what the Trump administration is doing with this.